you would be dusting everyday! And yet it is still artfully disheveled. I could not keep it up myself, but envy this kitchen owner. oh i love this! 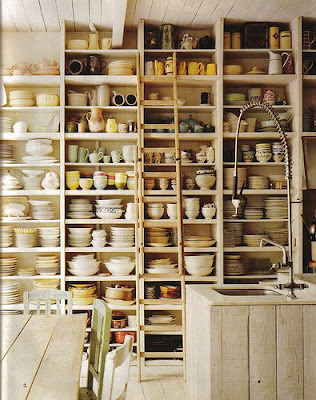 i want at least one or two open shelves above my sink one day. i love the look. this was very inspiring! thank you! There is no other word for this but fabulous. but if you love it than you'd just make best friends with your swiffer duster and love happily ever after! I've been working up my courage for about 25 years now! My next redo is the kitchen. I'm going to cover the walls in sheet mirrors and use chrome metro shelves. Everything open except—gasp—for cabinets I using gladiator rolling cabinets with workbenches top with butcher block other in stainless. I'm 59 years old—too old for beige and not enough time to find things stuck in cabinets. My friends think I've lost my mind...I think I've just found it!